According to medieval legend, the Holy Grail was the vessel from which Jesus Christ drank at the Last Supper, his final meal with his followers. Many works of literature describe the search for the Grail, which was believed to have sacred and mysterious powers. However, this quest, or search, did not always involve a physical object. For some, the Holy Grail represented a religious state of grace or union with God. In some accounts, the Grail held blood from Christ's wounds and was known as the Sangreal, meaning "royal blood." The highest and most noble goal of the Knights of the Round Table was to find the Holy Grail. Lancelot and Perceval searched for it, but only Galahad, seen here on horseback, achieved the goal. stories of the Grail begin with Lucifer, originally an angel in heaven who wore a crown adorned with a magnificent emerald. Lucifer rebelled against God and was thrown out of heaven. His emerald fell to earth, where someone made it into a chalice. In other stories, images of the Grail have ranged from a humble clay or wooden bowl to a golden goblet studded with gems or an object bathed in a blinding light. After the Last Supper, the Grail came into the possession of Joseph of Arimathea, who caught Christ's blood in it at the crucifixion. Joseph went to prison, but the Grail kept him alive by supplying daily nourishment. Released from prison, Joseph traveled to France and then to Glastonbury, England, carrying the Holy Grail. Soon, however, the Grail disappeared from the world because people were sinful. Hidden away in a mysterious castle, it was guarded by the descendants of Joseph's sister. One of the best-known versions of the Grail's later history is connected with Arthur, the legendary king of Britain. This account says that the Grail lay somewhere in a wild and desolate part of Britain in the castle of the Fisher King, a wounded monarch who lay between life and death. Only if the purest of knights found his way to the castle and caught a glimpse of the Grail would the Fisher King's torment end and life be restored to his wasteland. To the knights who sat around King Arthur's Round Table, seeing the Holy Grail was the highest and most noble goal. They roamed the nation in search of it. 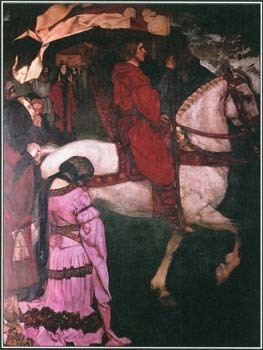 Lancelot nearly achieved the quest, but the sin of his love for Guinevere, Arthur's queen, kept him from seeing the Grail. A knight named Perceval (or Parsifal) saw the Grail but did not understand what it was. Only Galahad, Lancelot's son, was pure enough to see it with full understanding of its meaning. He had to travel to a distant land called Sarras to do so, for the Grail had left Britain at some point. The vision of the Grail brought such profound ecstasy that Galahad died moments later. Development of the Legend. The Holy Grail legend fuses Christian elements with much older Celtic* mythology and appears to be the product of storytelling over hundreds of years. The Grail itself is related to various vessels in Celtic lore, such as the drinking horn of the god Bran, which produced any food or drink the user desired. It was also associated with a magic cauldron that could restore life to any dead body placed in it. The earliest known work to give a Christian significance to the magical vessel was Perceval, a romance of the late 1100s by the French poet Chrétien de Troyes. A few decades later, Robert de Borron wrote Joseph of Arimathea, which established the connection between the Grail of Perceval and the cup used by Christ and later owned by Joseph. Parzival, by Wolfram von Eschenbach, expanded on the mystical story of the innocent knight and the Fisher King and also introduced an order of knights charged with guarding the Grail. This version of the story became the basis for the opera Parsifal by the modern German composer Richard Wagner. Over time, versions of the Grail story began to link the Holy Grail with the popular legend of King Arthur. One account made Sir Galahad the virtuous hero and the Grail a symbol of a rare and mystical union with the divine. Late in the l400s, Sir Thomas Malory wrote Morte D'Arthur (The Death of Arthur), the version of the Arthurian legend that was to become the best known. With it he established the story of the Grail quest by the knights of Arthur's Round Table and of Galahad's ultimate success. See also Arthur, King ; Arthurian Legends ; Galahad ; Lancelot . The holy grail is actually a formation of edible copper looking gold. it was first written about in the emerald tablet to melchizedek as lucifer later on would be the one to have originally formed it. this is further proven in the habbakkuk book of the bible by the one saying "tell the one who reads the vision to run for it is for an appointed time. behold the proud for he is a proud man indeed and transgresseth by wine... etc.." as it goes on talking about the antichrist that is lucifer. the emerald tablet being written by babylon is the reason she is the burden of jacob mentioned as sumeria being named as the burden (of jacob) for helping melchizedek or someone to drink the holy grail which has the secret to immortality. the emerald tablet also deals with the formation of the microcosm on venus and how the poles shifting will affect that.